FlyBMI promotion code 2018 - 15% discount on all flights! Super cheap flights to Cape Town, Seychelles, Madagascar or Mauritius from €282! Considering to use service of FlyBMI (British Midlands International) you can now easily save 15% off your next purchase using below FlyBMI promotion code 2018! All you need to enter this discount code during your purchase and proceed to next step. Note that promo voucher code only works on BMI Regional flights. You can use this discount on routes: Bristol to Paris, Dusseldorf, Milan, Aberdeen, Hamburg, Frankfurt and Munich. Southampton to Munich. East Midlands to Brussels. Norwich to Aberdeen. Newcastle to Brussels and Stavanger. Aberdeen to Bristol, Norwich, Esbjerg and Oslo. Plus, all other European flights such as Munich to Rotterdam, Brno, Milan Bergamo and many more. Althought considered as a low-cost carrier BMI Regional is offering to all their passengers free 23kg checked bag as well as snack and drin onboard. To apply FlyBMI promotion code 2018 simply use below voucher at the main page of the carrier where you will find separate box “Promo code”. 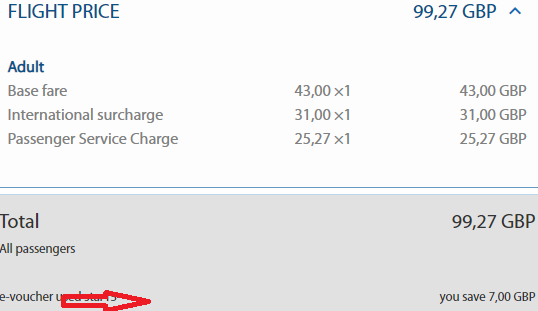 Discount applies only against base fare and does not discount optional service. FlyBMI Regional voucher code is applicable only when booking directly at website of carrier where you can also find all conditions of this current promotion. FlyBMI promotion code 2018 is valid for bookings made till end of September 2018. Travel period is then till end of October. For further details of this promotion you can check complete FlyBMI promo code conditions here. BMI Regional is British airline that operates scheduled flights across the UK as well as Europe. The airline has operating bases at Aberdeen, Birmingham, Bristol, Chester Hawarden, East Midlands and Newcastle. Planning to fly with this ailrine it is right time to book while this BMI Regional airlines promotion code lasts..
Booking sample of successfully applied BMI Regional promotion code 2018 below. In this case you would depart from London Stansted to Londonderry on 24th of October. Your return flight from within the United Kingdom would be on 30th of October 2018. You would easily save £7 just by using this latest BMI promo code. To make sure you have applies your BMI discount code you will see a mark “*15% discount included” right below summary of the flight..